What’s the Relationship Between Oil and the Dollar? Most traders have noticed the inverse relationship between the dollar and commodity prices—include crude oil. While this isn’t surprising for commodities priced in dollars, the inverse relationship also holds true for commodities priced in other currencies. Commodity traders should keep these relationships in mind when trading futures contracts, particularly when the dollar index experiences significant movements due to interest rate decisions or other factors. Let’s take a closer look at the relationship between crude oil and the dollar and what it means for traders. The dollar is the benchmark pricing mechanism for most commodities—including crude oil—given its status as the most stable currency in the world. If the value of the dollar falls, it costs more dollars to buy the same amount of commodity. On the other hand, if the dollar rises in value, it costs fewer dollars to buy the same amount of a commodity. These dynamics explain the inverse relationship between the dollar and dollar-denominated commodity prices. Even in cases where commodities aren’t priced in dollars, the dollar has a significant influence on prices. Foreign buyers purchase U.S. commodities, like corn or soybeans, with dollars, and they have more buying power when the relative value of the dollar falls. After all, they can exchange less of their local currency for each dollar. Demand tends to increase as the relative price of a commodity falls, leading to an indirect inverse relationship with the dollar. In the above chart, you can see that that the inverse correlation between the dollar index and commodity index tends to hold true. The period between 2014 and 2016 was a great example of commodities falling in value while the dollar rose in value. That said, it’s important to note that these inverse correlations exist over long-term trends rather than short-term trends—the inverse relationship is less pronounced when you look at shorter timeframes. The inverse relationship between the dollar and commodities isn’t a guarantee. After all, commodities are influenced primarily by supply and demand and the dollar is heavily influenced by interest rates. It’s possible that commodity demand could surpass supply at the same time that the Federal Reserve decides that it’s time to hike interest rates. In fact, that’s exactly what happened during the latter half of 2016 when both the dollar and commodity prices rose. Citi Research found that the correlation between the dollar and commodity prices has become less significant in recent years. According to the firm’s March 2017 report, commodities were strong towards the latter half of 2016 even as the dollar gained against other currencies. The firm believes that these trends are likely to persist for a while, although the inverse relationship is likely to resume over the long-term given the aforementioned causes. Commodity traders should treat the inverse relationship between the dollar and commodities as a long-term inverse correlation. In other words, it should be one of many reasons for a directional bet in crude oil or other futures contracts in the short-term—not the sole rationale. Commodity prices are influenced by a lot more than the dollar valuation and it’s important to consider all of these factors, especially when making short-term trades. Global changes in supply and demand. Geopolitical risks and conflict areas. Technical analysis also plays an important role in short-term price movements. For instance, short-term price movements often react to key support and resistance levels, while technical indicators can show when the market may be oversold or overbought. In the TrendSpider chart above, the auto-generated trend lines presented two clear trading signals. The multiple trend line resistance on October 1, 2018 provided a strong sell (short) signal, while trend line support just before the Christmas holiday provided a buy (long) signal. Traders can use these trend line levels to help time their trades and capitalize on short-term price movements. 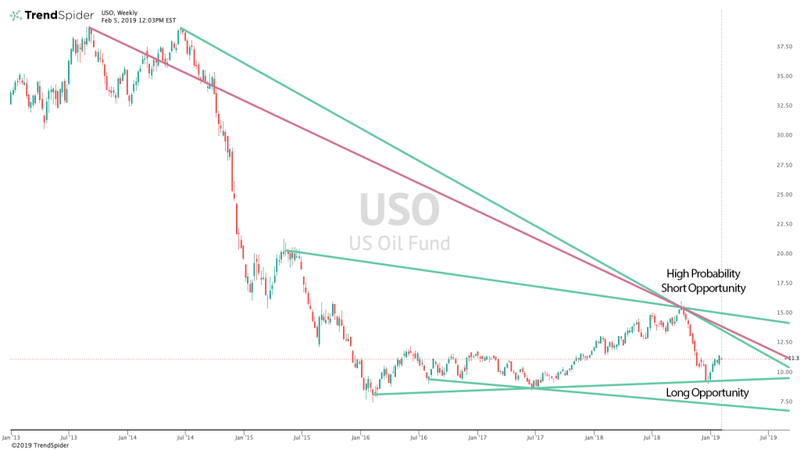 The dollar has a long-term inverse correlation with commodity prices, including crude oil, but it’s not a guarantee by any means, particularly in the short-term. Commodity traders should take into account a wide range of fundamental and technical factors when analyzing the market for trading opportunities. TrendSpider automatically identifies many technical factors by automatically drawing trend lines and identifying chart patterns. Sign up for a free trial today to save time and automate your technical analysis.